Eleven fillies will line up at Busan Racecourse on Sunday afternoon to contest the 16th running of the Korean Oaks. 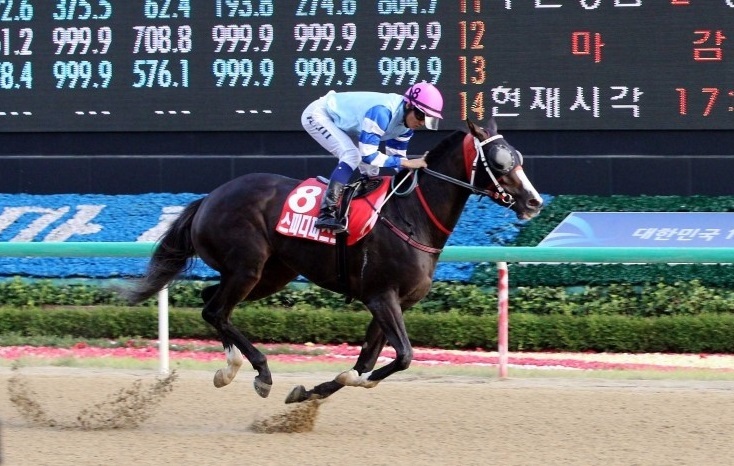 A Seoul-based filly has only won one of the seven running of the race since it was shifted to Busan in 2008 but in Meni Money, the capital this year brings one with a very good chance in what is the first Oaks to be run in June. She’s had the fewest starts of any in the field and got her maiden win in May over 1400M. She beat some reasonably promising horses that day but she is yet to show much speed. Add to that the question of the distance and while she clearly has potential, she will be an outsider. Jockey Nobuyuki Oyama takes his first mount in a Korean Classic. She has good speed and having led most of her races to date, is likely to be among the frontrunners early on. However, she was beaten by both Meni Money and Smart Time in the Sports Seoul Cup over 1400M in March and stamina is likely to be a key factor here. It would be a surprise if she stayed on. Kim Cheol Ho has been in good form this year. Yet to progress beyond class 5, and yet to go further than 1300M. However, she should be able to stay the distance and has generally been ridden back at the start of races before closing effectively. Speed is one thing that has been lacking so far and others may be quicker at the business end of the race. Masa Tanaka has been having a great year and while he is yet to win a Stakes race, he is firmly established in the top tier of jockeys at Busan. Her Seoul form is good and she comes in having won at class 4 over this distance. She led from gate to wire but it was a very slow race and while she will likely be another looking to get off to a fast start, whether she can maintain it in what is sure to be a faster run race will be the real test. Kim Hye Sun has ridden more thoroughbred winners than any other female Korean jockey. Another front-runner, she was 2nd behind Jibong Sarang in the MJC Trophy in March but has been a little disappointing in three starts since then. She is by no means the quickest in this race and is yet to be tested at the distance – although her dam was a winner at 1900M – and she won’t be among the favourites. Jockey Joe Fujii won the Oaks on Speedy First in 2013 and this could be his last ride in Korea for the time being. She won her first four races with considerable ease but didn’t quite stay on when stepped up to this distance at the beginning of May. She has plenty of speed though and if she stays a little better this time she must be seriously considered. She is another one who likes to go forward early – it could be very crowded up there. Jo Sung Gon is Busan’s leading jockey and he won the Oaks on Rising Glory in 2012. Seoul’s best chance and very possibly the favourite. She won the Sports Seoul Cup in March, beating Smart Time and Dia Girl and went on to win consecutive races at 1700M and 1800M. She doesn’t generally lead early so if there is a race to first corner, she should avoid it and she scores highly in terms of speed and staying ability. Her dam still holds the Seoul Racecourse 1800M track record and a Menifee filly has won each of the past four Oaks. Seo Seung Un is considered one of the rising stars in the jockey ranks and gives up a weekend of rides at Seoul to come to Busan for this. Another with a chance. She finished 3rd behind Jibong Sarang and Dangdae Cheonha in the MJC Trophy in March and has since run well at a mile and 1800M. Decent speed and she is yet another who in her previous races has liked to go forward early. She has every chance of going close. Jockey Kim Yong Geun won the Korean Derby and Oaks double last year on Queen’s Blade. She is the only filly in the race who ran in the Korean Derby last month, finishing 7th. Prior to that, she was beaten by Meni Money by just half a length in the Sports Seoul Cup in March and then ran reasonably well over 1700M. She hasn’t shown exceptional speed so far but she is solid and reliable and she should stay on. She was slow away in the Derby and closed well and that strategy may serve her well here too. Ham Wan Sik won two Stakes races on filly Ua Deungseon last year. The winner of the MJC Trophy on March 1. She won by five lengths and probably could have won by more. Shea beat Dangdae Cheonha and Jangpung Parang what day and while she hasn’t raced since, she will be one of the favourites here. In her early starts she looked to lead but in the MJC, she went to the back out of the gate and closed very strongly and should try similar in this. Jockey You Hyun Myung has won plenty of big races but never the Oaks. Likely to be the outsider of the field, she was 7th of 8 in the MJC Trophy behind Jibong Sarang. She’s run three times since then and most recently was a winner over 1200M. She has raced over a mile unsuccessfully over a mile before and this is a big step up today. She has tended to go forward in most of her races but may struggle to get to the front from the outside gate here. That may not be a bad thing though and she doesn’t seem to have reached her full potential yet. Jockey Kim Dong Young has won the KRA Cup Mile but never the Derby. *The Oaks is race 5 of a 6-race card at Busan with a first post time of 12:45. K-Pop girl-band “Red Velvet” will be performing. There are also 10 races at Seoul Racecourse from 10:50 to 18:00 and the Oaks – and all of the races from Busan – will be telecast live to Seoul.